This is my first time reviewing a wig from WigSupplier, despite buying from them for years already. This has been one of my favorite cosplay and wig stores and I have gotten quite some of their products and was always so pleased with them. 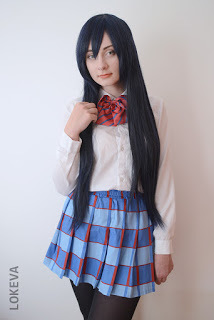 I usually bought short wigs or long wigs that ended up turned into short wigs, but this time I got an 80cm long wig and I’m going to review it for you! So, for starters, WigSupplier is very quick with the shipping and at responding to your emails/messages. I talked to them on facebook and got replies instantly. They are very kind and easy to understand despite not having the perfect English. They communicate way better than many US or UK stores, so that’s a huge plus. 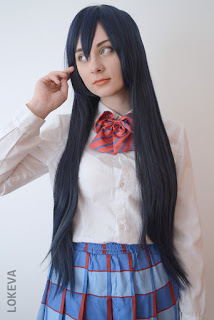 I believe the color was described wrongly as the actual color is blue and black instead of grey… But that’s alright as you get the wig that’s on the photo and not in the description! As you can see, the wig is very long and it has a dark color to it. 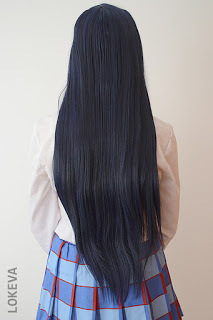 It’s blue and black, so the color might vary on the photos and camera settings… Under sunlight and stronger lights, the wig looks very blue. These photos were taken indoors with natural soft light. The wig is long, so expect some tangles. I used silicone spray on it and it worked magic. The wig became much easier to brush and keep in place! So, if you’re going for a long wig, make sure you get yourself a silicone spray. The wig is layered, so the top is much thicker than the bottom. This makes the wig much lighter on the head and easy to handle compared to many other long wigs with straight cut. 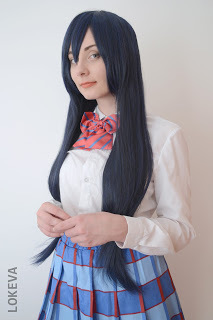 The wig is also heat resistant, so it was very easy to style it for our Love Live! photoshoot. The net of the wig is not visible and the fibers are well sewn to the wig. 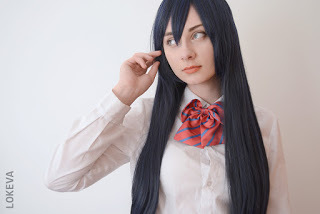 I think that the wig is really worth the price and that it’s a great wig for Umi since it has beautiful color and the right length for her. Overall, this wig is amazing and the store workers are very kind. I really enjoy shopping in their store and am very happy with the items I receive from them. I really do advise you to shop in their store when you need quality wigs for cheap! 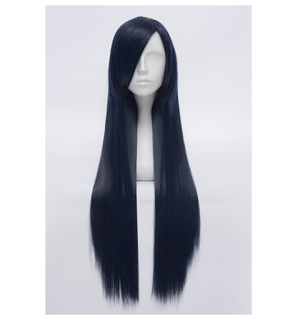 This entry was posted in Buy Cosplay Wigs, Fashion Wigs, Human Hair Wigs, L-email Wig review, Wig Maintenance and Care, Wigs and tagged anime cosplay wig, best cosplay wigs, black wig, cheap wigs, fashion wig, long wigs, straight wigs. ← Sailor Summer Dress – L-email Wig!